Pre-Baselworld 2013: Omega Constellation Sedna.Preview Baselworld 2013 Omega Constellation Sedna is the first timepiece to be made of gold 18K Sedna ™. 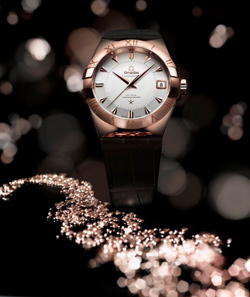 Preview Baselworld 2013 Omega Constellation Sedna is the first timepiece to be made of gold 18K Sedna ™. This watch limited edition blends the timeless lines of a well known collection with the world premiere of a new material. Sedna ™ is the name Omega watches gave a new alloy that combines three elements: gold, copper and palladium. The end result is an 18K pink gold, which means it has a minimum content of 75% gold. Sedna presents a unique pink color which highlights the right proportion of copper: the palladium content helps to ensure that the reddish tinge of gold Sedna has a long durability. This Constellation is named after a trans-Neptunian object that astronomers called Sedna – the same name of a goddess Inuit who says living on the bottom of the Arctic Ocean. The surface of this celestial body has been described as one of the most reddish in our Solar System. Swatch Group formed a team of experts in metallurgy and scholars from many of its companies with the common goal of creating a 18-carat pink gold alloy whose color is not only beautiful but durable. The alloy Sedna ™ is patented. Omega Constellation Sedna is the first watch to be made with this material. This wristwatch limited edition blends the timeless charm aesthetic of a family of classical models with the world premiere of an innovative alloy. The alloy Sedna 18 k, a proprietary blend of gold, copper and palladium, was created to ensure that the unique luster of rose gold case remains intact over the years. Also the indexes and the hands of Omega Constellation Sedna are of the same alloy, as well as the closure of the strap. Omega Constellation Sedna has a case in polished steel bezel with brushed highlighted effect tone on tone Roman numerals. It has a silver dial “pie-pan” inspired by the Constellation launched in 1952. The watch comes with a brown leather strap. Omega Constellation Sedna is driven by the Co-Axial caliber 8501 equipped with the spiral Si14 in silicon: the movement is visible through the sapphire crystal case back. The case is water resistant to 10 bar (100 meters / 330 feet). Omega Constellation Sedna will be produced in a limited edition of 1952 pieces to remember the year it was released the eponymous collection of watches. E ‘equipped with a special wooden box with a pink lining. The watch is guaranteed four years.